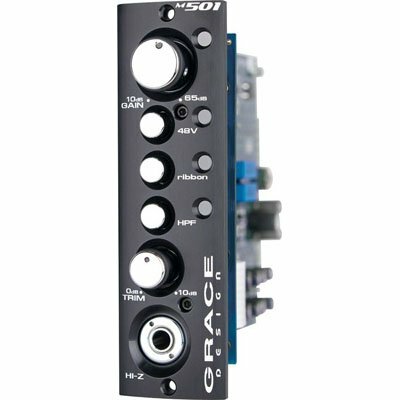 Check out the m501 - Grace Design's first-ever 500 series module. Packaged into this useful 500 series format, the m501 actually is actually a version of Grace Design's popular m101 preamplifier. It will fit inside any 500 Series module, which it requires in order to operate. This fully balanced, transformerless module features a 12-position rotary gain switch, hi-Z in switching, and a ribbon microphone mode that deactivates the built-in phantom power. A highpass filter and a trim pot are also built-in the Grace Design m501.